This lemon-tahini, sundried tomato quinoa salad is creamy, savory, and zesty– a perfect summer salad. The purple sweet potatoes not only pack in the antioxidants, they also add pizzazz to the meal! 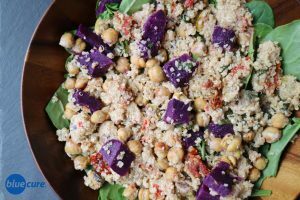 The chickpeas are a great source of protein and fiber, and when roasted, they give a nice crunch to the salad. The tomatoes are a good source of lycopene, a nutrient that may be especially beneficial for men. Leftovers of this dish are great– and can make for quick-and-easy lunches or dinner the next day. Preheat the oven to 400F. Wash the sweet potatoes and place whole on a baking sheet. Bake the sweet potatoes for 30-35 minutes, or until tender all the way through the potato. Once the potato is finished, allow it to cool and then chop. Line a pan with parchment paper and spread out the chickpeas on it. Roast the chickpeas for ~30 minutes. In a saucepan, combine quinoa with 2 cups water. Bring the water to a boil and then reduce to medium-heat. Cover the quinoa and cook for 15 minutes. Add in the pistachios, tomatoes, lemon juice, tahini, pepper, and greens. Stir until well combined, reduced the heat and cook on low-heat for an additional 5 minutes with the cover on. 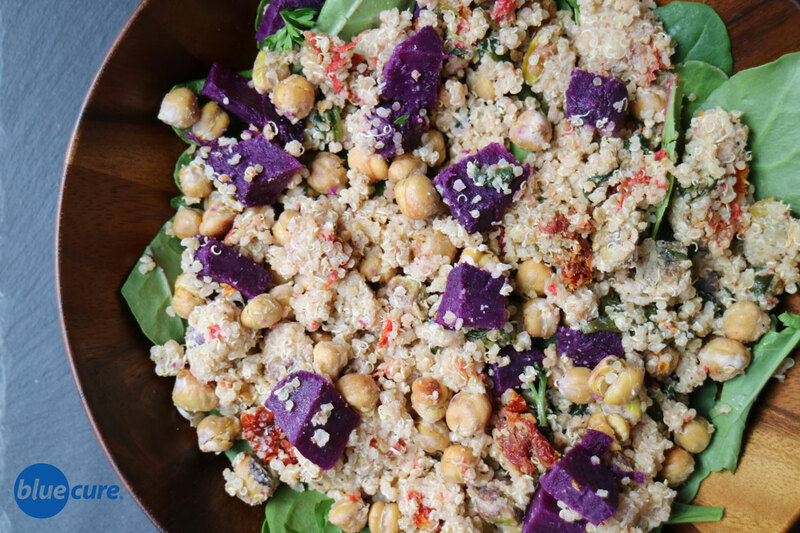 Serve the quinoa with the sweet potato and top with crunchy chickpeas. *Optional to chill the quinoa salad before serving. Enjoy!